Samsung Electronics is committed to both enhancing technologies and maintaining its responsible approach towards the environment. By cultivating a green attitude and outlook at each stage of design and production, the company aims to minimize its environmental footprint through all its business activities. In part two of our “Strides in Stewardship” series, we explore some of the ways Samsung is providing new value for customers and the environment through its green practices and eco-friendly mobile innovations. How can a smartphone be eco-friendly? Samsung works tirelessly to develop materials with improved eco-properties through collaborative projects between various departments including R&D and quality management. As a result of this effort, the company has released products containing bio-material using industrial corn, mineral-based plastic and a novel application of polyketone, a polymer produced with carbon monoxide captured during the formulary process, used in TVs for the first time in the industry. Samsung also uses recycled plastics for select products after classifying, cleaning and remanufacturing plastics from collected waste products in collaboration with recycling companies. The Galaxy S8, for example, uses recycled plastic in its inner packaging tray (30 percent) and charging adapter (20 percent). Half of the phone’s box is made up of recycled paper while its packaging and manual are printed with soy ink. Energy efficiency is another consideration for sustainability. For example, the Galaxy S8’s Fast Charging Charger (5V/2A, 9V/1.67A) is optimized with low no-load power consumption (0.02w) and enhanced charging efficiency (86 percent). Such efforts are the reasons why Samsung’s devices have continuously been recognized for their sustainable design and technology, achieving eco-labels in many markets around the world. The Galaxy S8, for example, has been granted a number of eco-labels including EPEAT and ECOLOGO Gold Certification by UL (USA), Carbon Trust (U.K.), Vitality Leaf (Russia) and Selo Colibri (Brazil). With the expansion of worldwide RoHS and REACH-like regulations, Samsung increasingly conducts rigorous inspections and management procedures for raw materials and parts it uses to ensure it provides safe, responsible products for customers. Among the company’s management efforts include the maintenance of an Environmental Analysis Lab for analyzing hazardous substances and volatile organic compounds, and an in-house monitoring process on restricted substances. Furthermore, Samsung has trained more than 650 internal auditors to execute environmental quality control to ensure that restricted substances are not intentionally present in its products. The company also operates the Eco-Partner Certification Program, a comprehensive environmental initiative, to assess the environmental impact of product components, raw materials and the manufacturing processes of its suppliers. To ensure the efficiency of the program, Samsung has developed the Environmental-Chemicals Integrated Management System (e-CIMS) to monitor hazardous substances used by its Eco-Partners, and works only with companies that have acquired all necessary eco-related certification. Currently, Samsung manages 1,058 partners – a number that has quadrupled since 2010. Additionally, the company has been voluntarily working to completely phase out the use of potentially dangerous chemicals such as polyvinyl chloride (PVC), brominated flame retardants (BFRs) and phthalates, and is continuously reducing usage of hazardous substances in its products. 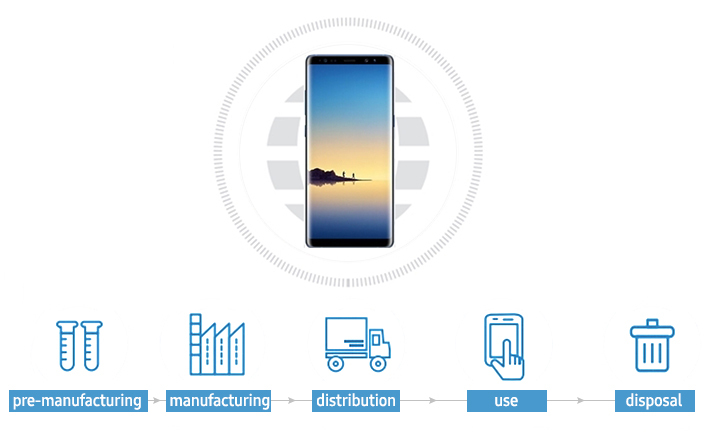 Over the past few years, Samsung has conducted a Life Cycle Assessment (LCA) for its leading smartphones. This methodology assesses 12 potential environmental impacts such as global warming, ocean acidification and ozone layer depletion contained at each stage of a product’s life cycle, from design and manufacturing, to purchase and usage, to end-of-life processing and disposal. This technique was first implemented in 2015 with the Galaxy S6 and Galaxy Note5, and was followed through to the Galaxy Note8, Samsung’s most recent flagship smartphone. The devices that underwent the 12 processes showed their largest environmental impact in the areas of pre-manufacturing and distribution. Based on LCA results, these areas are where Samsung is putting its focus on improving energy efficiency and reducing supply chain emissions of the devices, thus reducing the environmental impact of the products. In line with its commitment to constantly improve energy efficiency and recyclability, and reduce hazardous substances in products, Samsung has also established its own Eco-rating System which evaluates the sustainability performance of every product development project. The rating system consists of three grades – Premium Eco-Product, Good Eco-Product and Eco-Product – which are designated based on a product’s energy efficiency, resource efficiency and compliance with global environmental standards. Through continuous revision and evaluation of standards, Samsung reflects new eco features and the latest environmental innovation in its products. Product ratings have been increasingly improving, and the company is striving to have 90 percent of new development projects receive the Good Eco-Product stamp of approval or higher by 2020. To do its part to support the circular economy, Samsung is partaking in a variety of activities that improve resource efficiency and reuse resources. These initiatives include extending the periods of product use by offering services such as repairing products, upgrading firmware for performance improvement and extending warranty coverage periods. Additionally, rather than just discarding returned mobile products, Samsung changes their parts, reinstalls software and repackages them as refurbished devices, selling them at reduced prices. Provided in the U.S. and U.K., this service improves resource efficiency by facilitating the reuse of goods. For instance, Samsung earlier this year announced plans for reusing and recycling select components of Galaxy Note7 devices. Parts such as OLED display modules, memory chips, camera modules and raw materials have since been used for service purposes, sold as components or incorporated into the Galaxy Note FE, working with companies that specialize in the collection of recycling materials. Another ongoing project by Samsung is C-lab’s Galaxy Upcycling, which provides an environmentally-responsible way for old Galaxy mobile devices to be recycled. Seventy percent of used devices is left untouched after three years of their launch, and the number of such products is estimated to be 0.2 billion units every year. Those devices that might otherwise be forgotten in desk drawers or discarded are utilized to build new IoT open platforms, CCTV systems, game consoles and more. Samsung is also making multiple efforts to reuse resources by conducting activities such as the establishment of waste product collection systems, an expanded use of recycled materials and global take-back and recycling programs in approximately 60 countries. Creating a more sustainable economy will change the world in many ways, and Samsung will continue to do all it can to implement environmental and resource-related solutions while providing consumers with an increasing number and quality of responsibly-designed products.